Peterson and the danger at every corner. It was a query from someone at the Stress Office door to no one in particular. There were ten or so Stress Engineers at their desks; some were poring over their stress pads covering them with calculations using their Otis King cylindrical calculator; others were staring thoughtfully out of the windows and ignoring their Fowler’s circular calculator [both calculators are more accurate than a slide rule]. A copy of Chambers’s [a thick book of seven figure logarithms much more accurate than a slide rule] stood ignored on a shelf: not used since someone’s Detail Office days. The Stress Office product is calculation. “Try the Design Office”. The search was not for a person but for a book. A small number of books are so influential within a group, that the author’s name is enough to identify it exactly. So it was for several books among The Lad’s group of ’60s and 70’s design engineers. ‘Peterson’, ‘Kempe’s’, ‘Rollason’ were some. It is probably the same for any close-knit, professional group; not just the engineers. This piece is about the first-named; the others will come later. The front cover of Peterson © 2010. A slim volume, it is a maroon, hard-back with its title in gold, embossed lettering on the front cover. 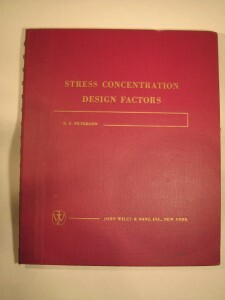 Called “Stress Concentration Factors”, by R E Peterson [Manager of Mechanics Department, Westinghouse Research laboratories], it was published in 1953 by John Wiley and Sons, Inc and Chapman Hall. 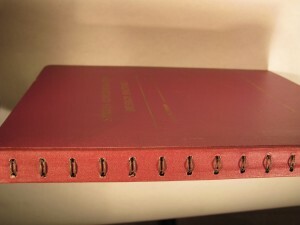 There was no title on the spine due to its unique binding. Almost every page of the book was a full-page graph that had to be scalable: each page therefore had to lie completely flat leading to the spiral wire binding protruding through the back. One of the most important measures in the engineer’s design tools is ‘Stress’. It is true that his task is to wrestle with forces but most forces can be withstood if the component is robust enough. 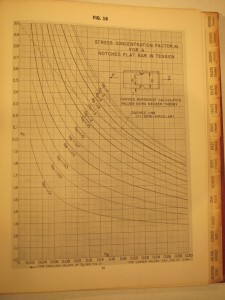 The usual design measure therefore is not ‘force’ but ‘force per unit of component area’. Just as the ‘price’ of an item is not always the most important number to the canny shopper; he will often compare goods or large or small packs with the ‘price per kilogram’. So it is with ‘stress’: we define the tensile strength of metals shown by experiments on plain test specimens as the stress [pounds per square inch in Peterson’s day – newtons per square metre nowadays] that they can reach in a single loading before they begin to fail. One of the features of the Mark One Comet had been its large rectangular windows. Unfortunately no allowance, or at least not enough allowance, had been made for the increased stress at these corners. The result of repeated pressurisation led to apparently low stresses in the fuselage greatly increased by unrecognised stress concentrations leading in turn to metal fatigue. The result was the aircraft at over 30 000ft split open explosively and plunged it and its passengers into the sea. It had been known before these and other accidents that the tensile strength measured from single loading was not the only measure of strength for metals. A component could fail at a much lower load if there were many cycles off and on. This lower stress is called the fatigue strength and is smaller, down to a lower limit, the more loading cycles that the component sees. The problem was that stresses in real components with holes or with more or less sharp corners or, worse – sharp scratches, were much higher close to the holes, corners or scratches than in the ‘plain’ sections. The purpose of Peterson was to provide the engineers with factors to multiply the simple stresses to give the higher stresses at changes in sections in components of every sort under every type of loading such as tension, bending and twist. The book is made up almost entirely of full-page charts: there are 125 of them culled from 174 references from the world’s literature at that time. A mammoth task. They were drawn by the hand of that (long gone) craft of the tracer using a template for the lettering. The few other pages show a digest of the relevant theory. The sample chart shown deals with the simplest of problems. A bar in tension with a notch in it. The vertical axis on the left gives the stress multiplication factor for use with fatigue calculations. You can see that it can easily reach two and a half times the simple stress and more. The amount depends upon the radius of the slot, the bottom axis, and the parameters of the widths of the bar and the ‘throat’ under the slot. Tragically for the Comet passengers, the fuselage had been designed before the advent of Peterson. But we can be assured that the book did prevent many more fatigue failures and probably many deaths. The Lad has a small collection of textbooks and professional reference books in editions contemporary with those that he used including Peterson. He had never seen another hard back binding like it. The Lad’s copy of Peterson came to him damaged with masses of ancient, cellophane tape like toffee over the wire binding. Ian Pell, the bookbinder of Derby, very skillfully recovered it for him by re-backing it to bring it nearer to its original condition. Thank you, Ian. The same complaint would probably be still expressed today were it not for the fact that, as a civil engineer friend of mine said, nowadays the cost of computation is effectively free. Along with that, the modern Finite Element Methods of computation allow today’s engineer to calculate stresses on a component using its actual shape. In those days instead, they used an idealised shape and then a factor to account for the real shape. Previous Previous post: The eternal question: Can you answer for it?